Phorid flies, also known as humpbacked flies, are tiny flies associated with filth and often confused with fruit flies. They breed in decaying organic matter and thus become problematic in hospitals, food establishments and homes as well as outdoors. 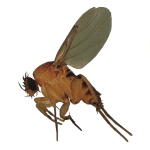 Phorid flies measure 1/16th to 1/8th of an inch long and have a humpbacked appearance. They look similar to fruit flies because of their small size, but lack the characteristic red eyes that fruit flies possess. The larvae of phorid flies are elongated, cylindrical, slightly flattened, and dirty white in appearance. Moist areas where food and water are present are most conducive to phorid fly breeding. Examples of these types of places include burn units, operating rooms, autopsy rooms, and morgues in hospitals; faulty septic systems, clogged basement drains, soil of potted plants, garbage cans, rotting meat and vegetables in homes; and kitchens, soft drink machines, and garbage receptacles in eating establishments. Phorid flies lay their eggs on decaying organic matter in such places as open wounds of people and animals, decaying animal and human flesh, feces, decaying insects, laboratory culture media, clogged drains, garbage cans, potted plant soil, and garbage disposals. To reproduce, flies lay about 20 eggs at a time. Within 24 hours, the eggs hatch and the larval (maggot) stage begins and lasts for 8 to 16 days. After the larval stage, the pupal stage lasts for 14 days, meaning life cycles take an average of 25 days to complete. Although they do not bite people, phorid flies cause anxiety and worry because of their presence in large numbers. When they are visible in restaurants, hospitals, morgues, autopsy rooms, and other places, this can be a bad thing for employees and visitors. Also, because they frequent places associated with filth, phorid flies can transmit disease. To treat for phorid flies, removing the breeding sources for larvae is key. In the meantime, pyrethrin or resmethrin containing aerosols sprays can be used to knockdown their population.